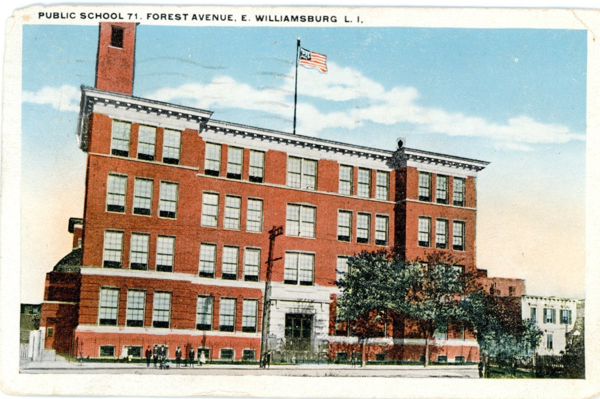 PS 71, East Williamsburg, L. I. Last week, Gothamist had some fun with a Kalmon Dolgin real estate listing that purported to be in East Williamsburg when it was in fact in Ridgewood, Queens. I’m sure Kalmon Dolgin was just fluffing their listing, as Gothamist said, but, there is a bit of historical accuracy to the moniker. Historically, there was a village just over the Queens border that was called East Williamsburg (Long Island! ), as the above postcard will attest. This was completely distinct from the enlarged area of the town (and later city) of Williamsburg east of Union Avenue, which was annexed to the original town of Williamsburg (west of Union) in 1835.
this 1945 market analysis of NYC mentionned it as English Kills, a reference to the channel which goes through the industrial area.